Here's how Japan became one of the top pizza-perfecting nations in the world. In partnership with Phaidon, F&W is sharing this essay and more from Where to Eat Pizza. According to regulations set by the VPN Association the dough for true Neapolitan pizza must be made with flour highly refined to the doppio zero (“00”) grade. It should have a final pH level of 5.8 and density of 0.79 grams per cubic centimeter. Once shaped by hand into a base no thicker in the middle than 0.4 centimeters (less than 1/6 inch), and garnished with only approved ingredients, the pizza has to be baked in a wood-fired oven at a minimum temperature of 905°F (485°C). The finished Margherita pizza is soft and elastic, its mozzarella appearing over the tomato in evenly spread white patches. The disciple copies the sensei. Often the Japanese are pursuing a made-in-Naples look, too. Though Neapolitan pizza does not require a Neapolitan-made oven, hundreds of custom-built, wood-fired pizza forni have been imported to Japan from Naples. 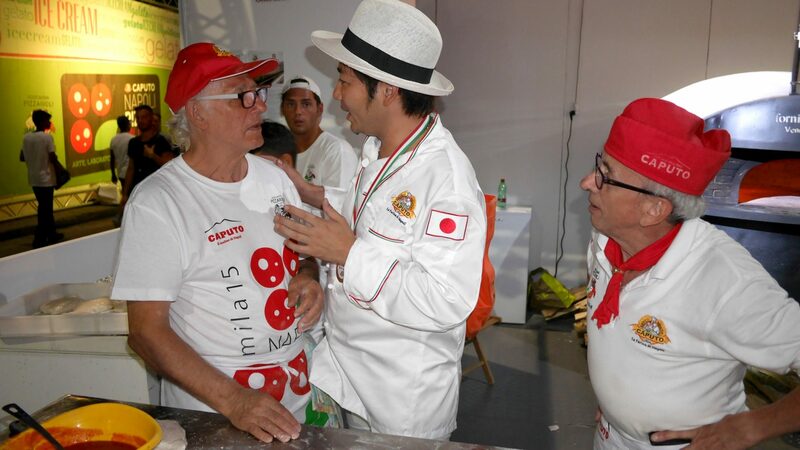 Akio Nishikawa, the Japanese pizza pioneer who apprenticed in Campania under Neapolitan pizza masters Gaetano Esposito and Gaetano Fazio, took home more than lessons learned to Sakuragumi, his Neapolitan pizza shrine in the Hyogo Prefecture. He ordered a custom-built oven by master craftsman Gianni Acunto to bake pizzas made with imported Caputo “00” flour, San Marzano tomatoes, and Mozzarella di Bufala Campana DOP. “You have to preserve the tradition if you wish Neapolitans to be moved when they eat your pizza,” says Nishikawa.